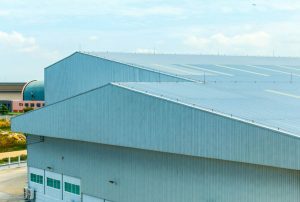 Commercial Metal Roofing is Widely Sought After, But is it Worth All the Attention? We’ll Find Out! There are countless roofing companies that will tell you that a metal roof is the best option option available on the commercial market. While there are numerous verified benefits associated with this sturdy form of roofing, how can one know if it’s the right choice for their business? Today, we’ll examine some of the many crucial factors (including cost, maintenance, and others) that should be weighed in the decision process. Afterwards, we’ll discuss the three primary materials available. 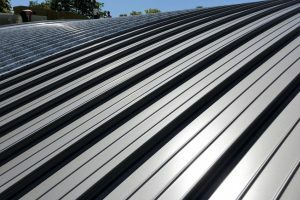 Once you’ve finished reading today, you should have a sense of whether or not metal roofing could be ideal for your company. Let’s get started! There are numerous benefits associated with metal. For one, it’s remarkably stronger (more durable) than traditional commercial roofing solutions. Base level metal roofs will last twice as long as single ply membranes and other flat systems. It’s also a simple matter to customize your roofing, from pre-painted metal roof panels to more ornate designs. Keep in mind, while metal roofing does offer fantastic benefits, it’s not for everyone. You’ll need to consider your own functional needs and budget. 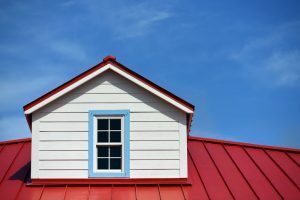 Below, we’ll weigh some of the most crucial factors that determine whether or not metal roofing is truly a cost-effective solution. As a premium roofing material, metal is naturally going to start with a higher material price. Per square foot, you can expect material costs to range from $5.00 to $12.00. That’s an admittedly wide pricing spectrum, which we’ll explain more later. In contrast, single ply materials range from a low $4.00 to $8.50. There’s one key factor that we need to include in our comparison however. Metal roofing provides twice the lifespan of single ply membranes. You will almost definitely be paying more at installation if you choose commercial metal roofing, but you will also enjoy your roof for much longer. What sort of maintenance requirements come with a metal roof? Thankfully, very little! Inclement weather is not as much an issue with durable steel, aluminum, or copper roofing. A seasonal rinsing of your roof will remove the majority of objects that could scratch or corrode the metal. For those occasional stubborn smudges, a simple combination of household (clothes) bleach, dish soap, and water should clear the grime away. Basic corrugated systems will also need the infrequent fastener tightening, but that’s only required every ten years or so. Finally, any large scratches may require some touch up paint. You can talk with your roofer about finding paint that’s approved by your roof’s manufacturer. One factor that many business owners forget about is repair costs. Commercial roof repair can blindside an unsuspecting manager if they aren’t cautious, but that’s not much of an issue with metal roofs. One of the most common issues with metal roofing is leaks, but not the kind you might think. It would normally take several decades for water to find it’s way into a professionally installed metal system, but there are certain weak points that could leave your business exposed. It’s vents, skylights, and other penetrations that are the usual culprits, but that’s true of any roofing system. Don’t get the wrong idea, though. Metal roofing is considerable more durable and far less likely to require any serious repairs. Even in the event of catastrophic damage (i.e. a tree collapsing on the roof) damaged panels can easily be replaced. Some business owners may point to rooftop coatings and ask “Wouldn’t single ply roofs with restorative coatings last just as long as metal systems?” The simple answer is no, because metal roofs have their own life-extending coatings as well. After decades of exposure to the sun’s ultraviolet light, metal naturally starts to dull (in terms of reflectivity). Corrosion may also start to leave a visible mark after so many years. Both these problems can be laid to rest with a simple roof coating. Many businesses take the opportunity to recolor their roof, but that’s a matter of personal preference. The point is, even a metal roof can benefit from a protective coating every so often. Steel Roofing is Often Preferred for Large Scale Roofing Projects Because of its Low Cost. So all this discussion leads us to a simple question: “Is a metal roof better?” In many ways, metal is clearly superior to traditional single ply roofing. Finding the roof that’s best for your business however, all comes down to matching your needs (functional and budgetary) with the material and style that best fulfills them. Since there are only three primary types of metal roofing materials (steel, aluminum, and copper), that’s a simple matter. When a business is searching for a low-cost material with capable protection, galvalume and galvanized steel are typically the preferred choices. For those companies that value building energy efficiency and low maintenance, aluminum offers very enticing savings. It’s high reflectivity makes aluminum and corrosion resistance one of the most highly sought after metals in the market. Finally, copper is ideal for enterprises that value style and longevity over everything else. Copper roofing can last for over a century, and the metal will retain over 90% of its original value in the end. Standing Seam Roofing Offers Impressive Waterproofing, Which Makes Maintenance Very Simple. Corrugated metal roof panels are generally the most economical variety, especially if you choose steel as your base material. A standing seam metal roof is a more costly version that incorporates overlapping panels and vertical locks to produce impressive waterproofing. In general, panel roofing is simple to install and maintain. Metal shingles and tiles on the other hand, create a homey appearance that many business owners fall in love with. For a more premium aesthetic, some have their metal roof coated with stone. If you’re looking more detailed styling options, metal shingle is probably a good choice. Find Your Commercial Metal Roofing Estimate! Want to learn more about metal roofing? Our experts at R.B.T Construction Roofing Division would love to answer any questions you may have about finding the right style and material for your roof! For more details, give us a call today at 903-691-0931. Posted in Uncategorized on January 7, 2019 at 4:16 pm by R.B.T. Construction Roofing Division. ← Is Roof Coating Any Good?